The relative efficiency of any particular image-coding scheme should be defined only in relation to the class of images that the code is likely to encounter. To understand the representation of images by the mammalian visual system, it might therefore be useful to consider the statistics of images from the natural environment (i.e., images with trees, rocks, bushes, etc). In this study, various coding schemes are compared in relation to how they represent the information in such natural images. The coefficients of such codes are represented by arrays of mechanisms that respond to local regions of space, spatial frequency, and orientation (Gabor-like transforms). For many classes of image, such codes will not be an efficient means of representing information. However, the results obtained with six natural images suggest that the orientation and the spatial-frequency tuning of mammalian simple cells are well suited for coding the information in such images if the goal of the code is to convert higher-order redundancy (e.g., correlation between the intensities of neighboring pixels) into first-order redundancy (i.e., the response distribution of the coefficients). Such coding produces a relatively high signal-to-noise ratio and permits information to be transmitted with only a subset of the total number of cells. These results support Barlow’s theory that the goal of natural vision is to represent the information in the natural environment with minimal redundancy. The atoms of vision: Cartesian or polar? D. G. Hubel and T. N. Weisel, “Receptive fields, binocular interaction, and functional architecture in the cat’s visual cortex,”J. Physiol. 160, 106–154 (1962). D. Marr, Vision (Freeman, San Francisco, 1981). H. R. Wilson and J. R. Bergen, “A four mechanism model for threshold spatial vision,” Vision Res. 19, 19–33 (1979). A. B. Watson, “Detection and recognition of simple spatial forms,” in Physical and Biological Processing of Images, O. J. Braddick and A. C. Slade, eds. (Springer-Verlag, Berlin, 1983). F. W. Campbell and J. G. Robson, “Application of Fourier analysis to the visibility of gratings,”J. Physiol. 197, 551–556 (1968). C. Blakemore and F. W. Campbell “On the existence of neurones in the human visual system selectively sensitive to the orientation and size of retinal images,” J. Physiol. 203, 237–260 (1969). D. Marr and E. Hildreth, “Theory of edge detection,” Proc. R. Soc. London Ser. B 207, 187–217 (1980). D. J. Field and D. J. Tolhurst, “The structure and symmetry of simple-cell receptive field profiles in the cat’s visual cortex,” Proc. R. Soc. London Ser. B 228, 379–400 (1986). L. A. Palmer, J- P. Jones, and W. H. Mullikin, “Functional organization of simple cell receptive fields,” in Models of the Visual Cortex, D. Rose and V. G. Dobson, eds. (Wiley, New York, 1985), pp. 273–280. S. Marcelja, “Mathematical description of the responses of simple cortical cells,”J. Opt. Soc. Am. 70, 1297–1300 (1980). J. J. Kulikowski, S. Marcelja, and P. O. Bishop, “Theory of spatial position and spatial frequency relations in, the receptive fields of simple cells in the visual cortex,” Biol. Cybern. 43, 187–198 (1982). 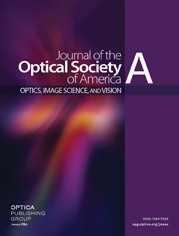 J. G. Daugman, “Uncertainty relation for resolution in space, spatial frequency, and orientation optimized by two-dimensional visual cortical filters,”J. Opt. Soc Am. A 2, 1160–1169 (1985). M. R. Turner, “Texture discrimination by Gabor functions,” Biol. Cybern. 55, 71–83 (1986). D. Gabor, “Theory of communication,”J. Inst. Electr. Eng. 93, 429–457 (1946). M. V. Srinivasan, S. B. Laughlin, and A. Dubs, “Predictive coding: a fresh view of inhibition in the retina,” Proc. R. Soc. London Ser. B 216, 427–459 (1982). S. B. Laughlin, “Matching coding scenes to enhance efficiency,” in Physical and Biological Processing of Images, O. J. Braddick and A. C. Sleigh, eds. (Springer, Berlin, 1983), pp. 42–72. E. Switkes, M. J. Mayer, and J. A. Sloan, “Spatial frequency analysis of the visual environment: anistropy and the carpentered environment hypothesis,” Vision Res. 18, 1393–1399 (1978). D. Kersten, “Predictability and redundancy of natural images,” J. Opt. Soc. Am. A 4, 2395–2400 (1987). J. J. Gibson, The Perception of the Visual World (Houghton Mifflin, Boston, 1966). H. B. Barlow, “The coding of sensory messages,” in Current Problems in Animal Behavior, W. H. Thorpe and O. L. Zangwill, eds. (Cambridge U. Press, Cambridge, 1961), pp. 331–360. H. B. Barlow, “Three theories of cortical function,” in Development Neurobiology of Vision, R. D. Freeman, ed. (Plenum, New York, 1979), pp. 1–16. H. B. Barlow, “The Ferrier lecture,” Proc. R. Soc. London Ser. B 212, 1–34 (1981). H. B. Barlow, “Understanding natural vision,” in Physical and Biological Processing of Images, O. J. Braddick and A. C. Sleigh, eds., Vol. 11 of Springer Series in Information Sciences (Springer-Verlag, Berlin, 1983), pp. 2–14. B. Sakitt and H. B. Barlow, “A model for the economical encoding of the visual image in cerebral cortex,” Biol. Cybern, 43, 97–108 (1982). A. N. Netraveli and J. O. Limb, “Picture coding: a review,” Proc. IEEE 68, 366–406 (1980). C. E. Shannon and W. Weaver. The Mathematical Theory of Communication (U. Illinois Press, Champaign, Ill.1949). D. A. Pollen and S. F. Ronner, “Phase relationships between adjacent simple cells in the cat,” Science 212, 1409–1411 (1981). R. N. Bracewell, The Fourier Transform and Its Applications (McGraw-Hill, New York, 1965). A. W. Rihaczek, “Signal energy distribution in time and frequency,”IEEE Trans. Inf. Theory IT-14, 369–374 (1968). R. F. Voss, “Random fractal forgeries,” in Fundamental Algorithms for Compuer Graphics, R. A. Earnshaw, ed. (Springer-Verlag, Berlin, 1985), pp. 805–829. D. J. Tolhurst, J. A. Movshon, and A. F. Dean, “The statistical reliability of single neurons in act and monkey visual cortex,” Vision Res. 23, 775–785 (1983). M. Hawken and A. Parker, “Spatial properties of neurons in the monkey striate cortex,” Proc. R. Soc. London Ser. B 231, 251–288 (1987). K. K. DeValois, R. L. DeValois, and E. W. Yund, “Responses of striate cortical cells to grating and checkerboard patterns,”J. Physiol. 291, 483–505 (1980). D. G. Albrecht, R. L. DeValois, and L. G. Thorell, “Visual cortical neurons: are bars or gratings the optimal stimuli?” Science 207, 88–90 (1981). The redundancy of any particular representation must be defined over all n th-order statistics (i.e., over all the possible conditional probabilities). Transforming the coordinate system from one set of coordinates to another (e.g., rotation) will not alter the total redundancy of the representation but may transform redundancy of one form (e.g., third order) into that of another (e.g., first order). T. Bossomaier and A. W. Synder, “Why spatial frequency processing in the visual cortex?” Vision Res. 26, 1307–1309 (1986). D. J. Tolhurst and I. D. Thompson, “On the variety of spatial frequency selectivities shown by neurons in area 17 of the cat,” Proc. R. Soc. London Ser. B 213, 183–199 (1982). R. L. DeValois, D. G. Albrecht, and L. G. Thorell, “Spatial frequency selectivity of cells in macaque visual cortex,” Vision Res. 22, 545–559 (1982). J. A. Movshon, “Two-dimensional spatial frequency tuning of cat striate cortical neurons,” in Society for Neuroscience Abstracts (Society for Neuroscience, Atlanta, Ga., 1979), p. 799. M. A. Webster and R. L. DeValois, “Relationship between spatial-frequency and orientation tuning of striate-cortex cells,” J. Opt. Soc. Am. A 2, 1124–1132 (1985). It should be noted that the neurophysiological data do not support the notion of constant bandwidths in octaves.37,38 Not only is there a wide range of bandwidths but the average bandwidth shows some decrease with increasing frequency. The present model has yet to account for this decrease. Fig. 1 Information diagrams, as proposed by Gabor.14 These diagrams represent the information carried by a one-dimensional array of elements. For example, (a) represents the information carried by 18 pixels. Each pixel is localized in space but extends in frequency. The Fourier transform (b) represents the same amount of information with 18 sines and cosines. Each element is localized in frequency but extends in apace. (c) and (d) show Gabor codes in which the information is represented by elements that are localized in both space and frequency. The area represented by any element is constant, and the total number of elements is also constant. Fig. 2 Relations between the size of the channel in the frequency domain and the size and spacing in the space domain. A channel with a bandwidth ΔF (frequency domain) consists of an array of sensors with a width ΔW (space domain). The spacing along the width ΔSW will be proportional to the width ΔW. A channel with an orientation bandwidth Δθ (frequency domain) consists of any array of sensors with a length ΔL (space domain). The spacing along this length (ΔSL) will be proportional to the length. Fig. 3 Relations between the spacing of the channels in the frequency domain and the spacing of the sensors in the space domain. The upper two rosettes represent two possible coding schemes. Both codes consist of channels that have constant spatial-frequency bandwidths in octaves and constant orientation tuning in degrees. The rosette on the left consists of channels that are more broadly tuned to orientation and more narrowly tuned to frequency than those of the rosette on the right. The bottom two diagrams give a rough idea of the relative spacing of the sensors for two of the channels. Fig. 4 The envelope of the response of one channel. Some of the calculations in this paper are based on the envelope of the response of the sensors. This envelope is sometimes referred to as the amplitude of the analytic signal28 or the energy-density waveform.2 9 (b) The response of an even symmetric channel to the image in (a). (c) The response of an odd symmetric channel tuned to the same frequencies and orientations. (d) The envelope, representing the root mean square [Eq. (6)] of the images in (b) and (c). The envelope takes into account both the real energy and the reactive energy of the image28 and thus permits a measure of the energy at a given location within a particular orientation and frequency band, independent of the phase of the individual sensors. Fig. 5 An example of coding with six different channels. (a) Examples of the six types of sensor associated with each channel. (c) Convolution of the image in (b) with the six sensors shown in (a). The response of the individual sensors is determined by sampling these filtered images at a distance proportional to the size of the sensor (shown with dots). This diagram shows the response of only the even symmetric sensors. A complete code would involve the odd symmetric responses as well as the full distribution of orientations and spatial frequencies. Fig. 6 Examples of the six images (A–F) in this study. Each image consists of 256 × 256 pixels with 256 gray levels (8 bits). However, only the central region was directly analyzed (160 × 160). See the text or details. Fig. 7 Two-dimensional amplitude spectra for two images from Fig. 6 (A and D). The center of such a plot represents 0 spatial frequency. Frequency increases as a function of the distance from the center, and orientation is represented by the angle from the horizontal. For the sake of the clarity, each 256 × 256 amplitude spectrum has been reduced to 32 × 32. Thus each point in this plot represents an average of an 8 X 8 region of the spectrum. Such plots show that amplitude decreases sharply with increasing frequency at all orientations. Fig. 8 Amplitude spectra for the six images A–F, averaged across all orientations. The spectra have been shifted up for clarity. On these log–log coordinates the spectra fall off by a factor of roughly 1/f (a slope of −1). Therefore the power spectra fall off as 1/f2. Fig. 9 Plot of energy per octave for each of the six images, for which energy is defined as the integral of the power spectrum between f and 2f. For example, the data at 10 cycles/picture represents the total energy between 10 and 20 cycles/picture across all orientations. Although the results vary from image to image, these data suggest that, in contrast to the amplitude spectra, there is roughly equal energy in any given octave. By Parseval’s formula [Eq. (10)] this implies that the variance of the filtered image (filtered through a given octave) will be roughly constant. See the text for details. Fig. 10 Energy distribution for two artificial images. Image 1 consists of random points with a probability of 0.01. Image 2 consists of 10 sinusoids. The plots shown at the bottom of the figure describe the energy (as measured from the variance in the responses) represented by different subsets of sensors in relation to the total energy. Consider the data from Image 1 when the bandwidth is 1 octave. To get the data for this plot, the image was filtered through a rosette of 1-octave-wide channels (circular in the frequency domain: ΔF/Δθ = 1.0). The responses of the individual sensors and the envelope were then determined by appropriate sampling. The lowest curve labeled (0.01) shows the relative energy of the top 1% of the most active sensors. For Image 1, 1% of the sensors code about 20% of the total variance when the bandwidths of the channels are 1 octave, while 2% of the sensors code about 35% of the variance. The data for Image 1 show that more of the total variance can be represented with a small subset of the total sensors when the bandwidths are broadest. In contrast, for Image 2 more variance can be represented by a small subset of the total sensors when the bandwidths are narrowest. Fig. 11 Energy distribution for the six natural images. Results show the energy represented by different subsets of sensors. Results are shown for the range of 0.12–3.2 octaves. The ratio of orientation bandwidth to spatial-frequency bandwidth (ΔF/Δθ) is fixed at 1.0 (i.e., circular channels). Fig. 12 Relative response of the different subsets of sensors as a function of the bandwidth. For example, the plot labeled 0.01 represents the average response of the top 1% of the sensors relative to the average response of all the sensors. If we consider the sensor response to be subject to noise, then this plot can be related to the signal-to-noise ratio. It suggests that spatial-frequency bandwidths in the range of 1 octave produce the highest signal-to-noise ratio. Fig. 13 Relative response of the different subsets as a function of the ratio of the orientation bandwidth to the spatial-frequency bandwidth (ΔF/Δθ). A ratio of 1.0 represents a channel that is circular in frequency space. A ratio of 0.25 represents a channel that is narrowly tuned to orientation realtive to the spatial-frequency tuning. For all plots shown here, the spatial-frequency bandwidth is fixed at 1.2 octaves. Fig. 14 Comparison of the Gabor and the log Gabor functions. The far left-hand images show examples of the two functions in their even symmetric form along with the response amplitude across the midline. The amplitude spectrum of a Gabor function is represented by a sum of Gaussians (positive plus negative frequencies) and will be roughly symmetric on a linear axis. The log Gabor is a Gaussian on a log frequency axis. The channels in our rosettes have constant bandwidths in octaves, and therefore the amplitude spectra of the different channels will the the same scale on the log frequency axis. As shown by the plots on the right, the Gabor functions overrepresent the low frequencies with this type of sampling. This is not the case for the log Gabor. Fig. 15 Comparisons of the Gabor and log Gabor functions for coding the six natural images. Each plot shows the average result for the GTabor functions from Figs. 11 and 12 (dashed lines) and for log Gabors (solid lines). With bandwidths greater than 1 octave, the log Gabor shows the potential of producing a more compact code. (3) Δ θ = k 1 / Δ L = k 2 / Δ S L .
(4) N s / c = 1 / ( Δ S W Δ S L ) = ( Δ F Δ θ ) / k .
(5) N st = N c N s / c = α ( Δ F Δ θ ) / ( Δ F Δ θ ) = constant . (6) E ( x , y ) = [ R ( x , y ) 2 + I ( x , y ) 2 ] 1 / 2 . (9) g ( f ) = k / f 2 .